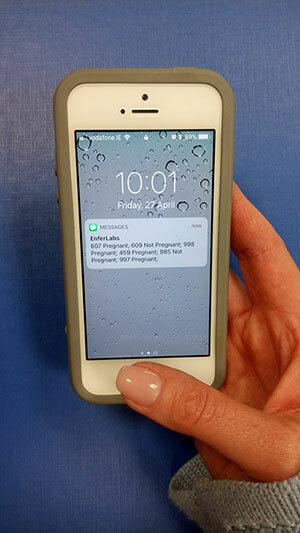 Enfer’s fully validated Milk Pregnancy test accurately detects pregnancy from 28 days post breeding using milk samples.It is a cost-effective way to confirm open cows and maximise overall herd health management programs. This is an ELISA test which detects Pregnancy Associated Glycoproteins (PAGs) to accurately determine whether or not a cow is pregnant. PAGs will circulate in milk for a certain period of time after embryonic loss or abortion. Current estimates indicate that these disappear after 7 days. In the case of abortions, they may remain for longer. So……. What do you have to do? 1. Call Enfer on 045 983800 to order your kits. We will send containers with preservatives for the milk collection. Take the milk samples and record the cow number on it. Make sure there is no carryover from other cows. Orders of three or less sample containers will incur a P&P charge. 2. Post the samples back to Enfer within 24 hours of taking them. Samples can be returned using the envelopes provided. Just complete a form with the samples and mark the bottle with the cow number. 3. We will text the result to your mobile the day after we receive them. The test result is based on the quality and integrity of the sample received to the Laboratory. No responsibility is accepted for incorrect results arising from mis-identification or poor-quality sample prior to arriving at the lab.